I originally read this book in 2011 but I received the audiobook for review this month. Good thing too because I had forgotten the story. It was nice to revisit this world. First Thought: It is rare when you can be sympathetic to both sides of the “fight” but that is the case with Touch of Crimson! Story Talk: This world, these people, and their hopes/dreams/fights/stations really moved me. 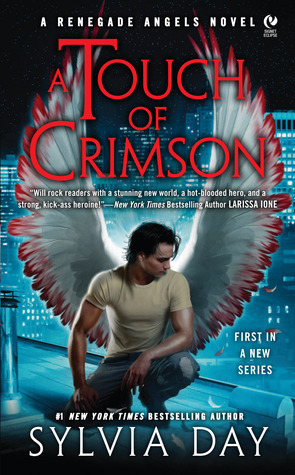 Touch of Crimson managed to bring you a world view from all sides without drawing away from the root story. In the end (no spoilers) you were left wanting more and very sympathetic to almost everyone’s plights. Character Talk: I liked Adrian and Lindsey but never quite fell in love with them. It might be that I felt Adrian was a bit of a hypocrite most of the story and that the angels were a little harsh in general. They were my least favorite of the immortals and their treatment of the Lycans made me want to scream. That being said, Lindsey and Adrian had fantastic chemistry and their love story worked well. Luke Daniels is one of my favorite narrators. I don’t know how he does it but he manages to sound different in every series he narrates. He did a great job with A Touch of Crimson! I looked ahead and it looks like the next book is narrated by a woman. I think this might work well for this series! Final Thought: The world building and character building were fantastic. I am thrilled that I have the 2nd one on audiobook sitting right next me! While I'd probably skip it based on your character review… I'm intrigued by how much you loved the world. Great review! Angels, Lycans, and VAMPIRES! It's like this book was made just for me. heheheBut yeah, I probably wouldn't be too happy with Adrian's antics. I'm too much like Rhys Trahaearn. We don't like hypocrites. Hm… Looks like one I'd enjoy but might wait until the second one since parts made you want to scream. Sometimes stuff like that is resolved in the next book(s). I am looking forward to reading this book myself, lovely review.